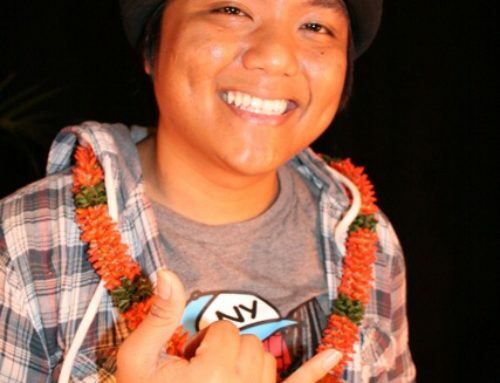 I first laid eyes on Troy Lazaro when he was a slip of a boy, probably still in high school, at Nathan Kalama’s 50th birthday party which was a back yard-under the tent-singing and dancing all night kind of Hawaiian lu’au party. I could not believe the way this young man danced in one continuous smooth movement like his bones could all bend. More than his fluidity, I held on to the memory of the most joyful expression on his face. I can still visualize the way he danced. Soon he was appearing on stage as a singer as he became involved in Hawai’i Stars. When the audience applauded I would often say to whoever was sitting next to me, “. . . but, you should see him dance the hula!” I wondered if I would ever see him dancing hula again because he seemed headed in the direction of aspiring young singers. 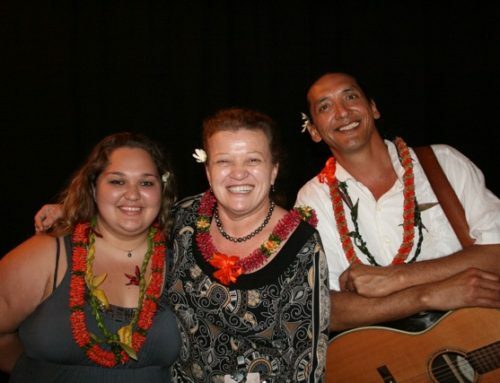 It wasn’t until last year when I was coordinating the Aloha Week events for Kaua’i that he surfaced as the singing dancing emcee for Kumu Hula Doric Yaris. Since Doric was in charge of the program for the westside celebration at Waimea Plantation Cottages, he got Troy to hula, sing and emcee. With his spontaneous gift of gab he was the most entertaining emcee. He also started attending last year’s EKK Mondays and expressed so much appreciation for the artists who came to EKK. It was time to have Troy share his talents at EKK. Not only was he ready and willing to present at one of the EKK Mondays, he came up with the brilliant idea to leave the audience with the “Perfect Hawaiian Memory” by sharing the most exquisite hula mele danced by solo hula dancers. What a concept! It turned out to be a wonderful gift to everyone there. The morning after, my email was flooded with comments from many who were there and appreciated what Troy shared. Troy was a difficult person to pin down because does the cultural programs at Waiohai Marriott and teaches ZUMBA probably eight days a week, but I am persistent so when Troy said that he was thrilled with the invitation because it gave him a chance to get back to his hula roots, I was elated. When someone possesses a gift like Troy’s, it’s important to explore the possibilities of sharing that unique gift. He did just that in a mesmerizing non-stop two hour program of singing, dancing and the sharing of Aloha. Troy is theatrical. Dressed all in white accented with red feather head lei and sash and Niihau shell leis cascading out from under his flowing white short pareau, he set the tone for the evening with a beautiful hula and asked everyone to stand and join him in a pule and followed with a Christian spiritual Magesty as he presented his kumu with a lei. Accompanied by the wonderful music of Na Molokama — Fred Aki, Jr., Alberto Genovia and Bruddah DeFries — Troy launched into an exciting program of solo hula dancing to angelic hula songs of Kaua’i and Hawai’i. As he put it, he loves to see the spotlight on a dancer who “owns the stage.” Stunning were all the hula dancers. It felt like we were having our own private Kaua’i Style “Merrie Monarch” exhibition as dancer after dancer came up and showed us why they had won their much deserved titles. Kainani Viado, stunning in a long red velvet holoku setting off long strands of rice-style shell lei, was captivating as she dance Hopoe by Kawaikapuokalani Frank Hewett. Troy shared the story of the flowing lava from the volcano that inspired the song. She also danced to the song Where I Live There are Rainbows as sung by Troy. Jayden Pavao, Miss Keiki Hula 2010 and niece of kumu hula Leina’ala Pavao Jardin, brought to life the beauty of Wai’ale’ale, Nohili near Polihale and the swaying hala on the north side of Kaua’i in the song Nani Kaua’i. Youthful and poised beyond her years, Jayden captivated the audience with her sweet energy and smile. Hi’ilawe, a hula favorite, was exquisitely danced by Miss Keiki Hula 2009 Breeze Ann Pavao, daughter of Leina’ala Pavao Jardin. At her young age Breeze already has a number of “titles” for her accomplished hula ability; it was evident as she floated across the stage and moved like the wind on bamboo that she was born a hula dancer. Jenny Lynn, former Mrs. Kaua’i Mokihana Hula, won her title in the annual Kaua’i Mokihana Festival. Her hula rendition of Waika was stunning as Troy harmonized with Na Molokama. She also dances in Leina’ala’s halau and moves with the elegance and grace exhibited by her dancers. The beautiful Jayna Shaffer, former Miss Kaua’i Filipina and Leina’ala’s halau representative to this year’s Merrie Monarch Ms. Aloha Hula solo competition was stunning as she danced to Kawaikapuokalani Frank Hewett’s Ola’a Beauty, a song that Frank shared when he came to EKK last year. Jayna’s exquisite and sensitive beauty captured everyone’s heart as she commanded the stage with her mesmerizing grace and poise. Troy honored the majestic uplands of Koke’e with the song Mokihana Lullaby made popular by the late Loyal Garner. He talked about the rarest of blossoms found only in Koke’e. Later in the show he sang Me and Mrs. Jones to represent the years he spent as part of “Hawai’i Stars”. The audience loved the interactive activities. Troy invited anyone who wanted to dance up to the stage and the adorable Yumi Teraguchi, formerly of Japan and now Anahola, swished, swayed and paddled her boat in Hula O Make’e, another hula favorite about Captain Make’e’s ship which sank off the coast of Kapa’a. Troy’s playfulness with the audience was infectious as he said, “I want to do something. Can I do that? Of course I can do what I want, yeah?” and had the whole audience finger snapping and singing faster and faster as he taught a Samoan song he learned from his cousin who married a Samoan princess…the real kine princess. When he started adding fast-moving hands and feet dance motions, no one could keep up with the agile Zumba master but everyone tried and had great fun. Further involving the audience, he asked all the ‘ukulele circle players to sing and play Hawaiian Superman made famous by Israel “IZ” Kamakawiwo’ole. Troy dramatically shared the legend of demi-god Maui that inspired the song. The most touching part of the evening was when he sprang a surprise on Kumu Hula Doric Kaleonui Yaris to come up on stage to sing. “Shall I dance a hula for you? asked Troy; shouts of “Yes!” came back from the audience. “What shall I dance, Kumu?” asked Troy; Doric instantly called out I’ali’i No’oi which Troy recalls he learned in the Waimea High School band room. Troy invited Kumu Doric to come up and sing while he shared his heartfelt appreciation for Doric for all he had done to help Troy become the person he is and learn the hula without ever spending a penny. As Doric slowly approached the stage, the playful Troy shared a story about this person from Pakala (Doric) in a fun melodramatic interactive storytelling style inviting the audience to join in with expressive words. Troy loves to dance the hula to the beautiful voice of Doric because it takes him back to the moment he learned the hula and the hula comes so naturally; his feeling to dance comes from deep inside and becomes more than just a hula. As he spoke of Doric it was so evident that the love and respect he felt for his kumu was as tangible as the hula itself. Doric sang the fast-paced hula as Troy danced it just as fast . . . no wonder he won the Mr. Mokihana Hula competition when he danced this number. “I am so proud of Troy; my work is shown through my students,” said Doric. Of course the audience called for a hana hou and Doric obliged with Manu ‘O’o which Troy dedicated to all the kupuna in the house. “I have not danced this since junior high,” said Troy, but no one could tell as he moved sensuously around the stage.. He confessed that the show was being put together right on stage with no rehearsal….and that is why it was so fresh, spontaneous and delightful. Building up to honoring Kumu Hula Doric, Troy shared his experience with Doric’s late wife Momilani Yaris who has left a lasting impression on Troy just because of how she treated everyone. A shy person, Momi over the years gained confidence in playing the ‘ukulele and even sang in Japan her favorite song by Amy Hanai’ali’i Gilliom. Troy sang the song while Kainani danced to Palehua. As a tribute to Aunty Momi, he asked Kumu if he could dance to her beautiful song, Ke Kauoha Kumu Kahi-Mele. Troy expressed his appreciation for Uncle Nathan Kalama, who together with Doric, Maka Herrod and Aunty Puna Dawson, form the hula hui called “Hui o Kalama’ola”. This hui believes in the sharing of hula resources and provides the dancers the freedom to learn the hula from many sources. Uncle Nathan unfortunately could not be present, but his presence seems always to be felt by everyone there. Troy called Kainani back to the stage to dance Queen’s Jubilee written for Queen Emmalani. Troy harmonized with Na Molokama so the singing was simply great and the whole evening of angelic hula music with gorgeous dancers left everyone with a natural high and great appreciation for the gift. PS! Bring heavy sweater or jacket with you next week; the ballroom temperature will make you feel like you are in Minnesota. Who’s Coming Up Next at EKK — the FINAL EKK MONDAY of the season! P.S. 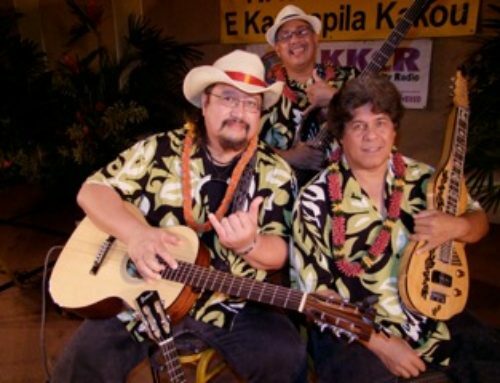 The Kamoa ‘Ukulele donated by Larry’s Music will go to one lucky winner TONIGHT!